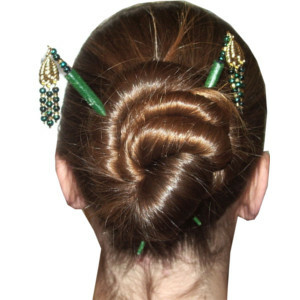 Hair Sticks are an elegant hair accessory for women that are simpler to use than they look! For all of you who are new to hair sticks, a hair stick is a straight stick that comes to a point at the end. It is generally between 5 and 9 inches in length, and when two hair sticks or chopstix are used together they can hold hair up and out of ones face. They are fashionable, stylish and are a really exciting hair accessory once you know how to use them. Believe it or not, hair sticks have been in use for thousands of years. Hair sticks were a popular hair accessory in the cultures of Ancient Egyptians, Greeks and Romans, and although most of them were jeweled luxury items, in Rome they were mainly simple and wooden and were worn by all, no matter their financial standing. Of course, the more common culture that wore these hair sticks were the Japanese, who still wear them today, along with anyone and everyone who came to find them dressy, original and right up their ally. So as you can see, women have been styling their hair using hair sticks for a long time now, but still, many people have no idea how to use them. Although the result looks really elegant and extremely complicated, the truth is that once you get the hang of it it’s really simple! So for all of you out there who are interested in giving them a shot, below are a few simple steps of making a bun in your hair with hair sticks. 1. Start by brushing or coming your hair. 2. Hold your hair into a pony tail and hold the base tightly with your left hand. 3. Take your right hand and twist your pony tail into a spiral. 4. Then, take your twirled pony tail and start twirling it around and around the base of the pony. Once you’ve twirled it half way, take your left hand off from the base to hold the forming bun securely. 5. Tuck the end of your pony tail under the bun. 6. Secure the bun using a hair stick. Insert the stick pointed in and up, then lift like a lever and weave the stick into your hair. The first few times you try it, you may want to give up – but try again because you’ll get the hang of it and hair sticks are really a great hair accessory to add to your collection! Now that its Gift Season, bet you’re all wondering what to get for that special person. Trying to stick to a budget, head coverings and hair accessories are definitely your best shot since they can go from any price range and are very well priced. In addition, now that its winter, everyone is starting to stock up on their winter wardrobe; perfect timing to send someone a stylish and special winter head covering or hair accessory. 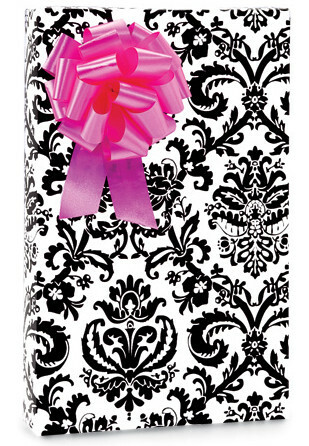 Gift Wrap makes the perfect gift all the more perfect! Below are some really great ideas for holiday gifts! There’s something for everyone! 1. For someone who doesn’t cover their hair/head, you may want to get them a warm winter hat since no one ever has enough of those in the winter! Of course, depending on the giftee’s age and stage you might want to try a nice piece of costume jewelry, hair accessory or a hot pair of air muffs! 2. If you are purchasing something for someone new at covering their hair, try something simple, basic and top quality to get them exciting about the whole “covering” thing. You may want to try a soft cotton pre-tied bandana, a crochet snood, an Israeli tichel or a cotton cap depending on their style. For those with hair loss, it’s best to try and stick to cotton head coverings since they allow air to go in and out therefore preventing them from getting sweaty. 3. For someone who’s been covering their hair for a while now, be daring and try to get them a head covering they never tried before. For example, if they are totally attached to caps, try buying them a pre-tied bandana or a chenille snood! Everyone likes to try something new, I’m sure they’ll enjoy it! Of course, try to stick to colors that she likes so that it shouldn’t be too different and scary to try. 4. If you are not sure which head coverings they would like, you can never go wrong with getting them practical things to wear under their head coverings. The Milano WiGrip is a band with grip to wear under a headscarf or wig to ensure security without giving headaches. 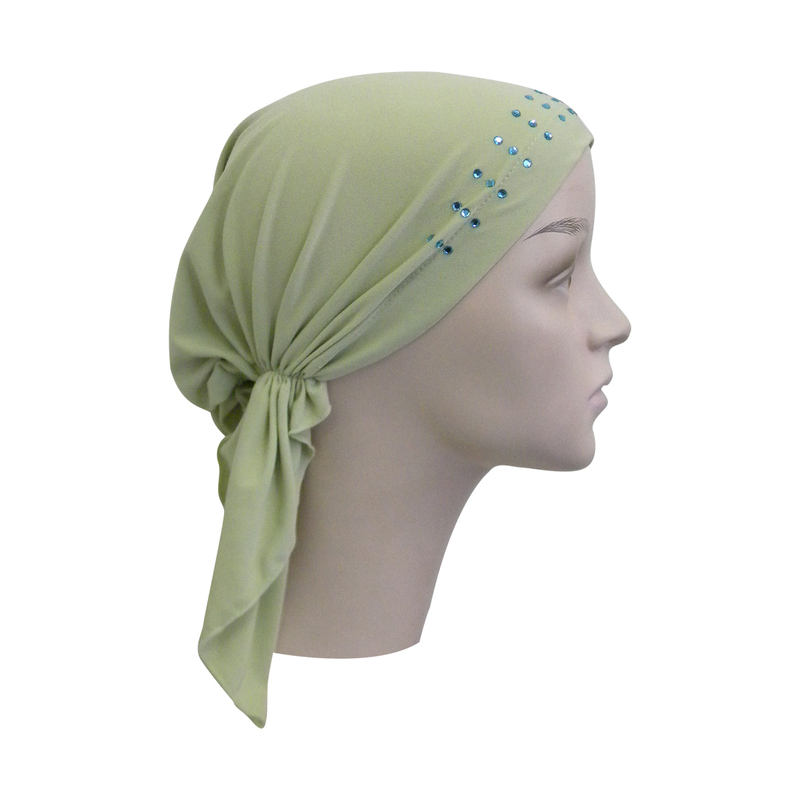 In addition, for those with hair loss, the hidden height undercover is a fitted cotton hat with a little volume to wear under head scarves to give the illusion of hair. 5. Everyone loves a gift certificate! With a gift certificate they can choose their favorite items according to their style and taste- that way you know for sure you got them something they love! A gift certificate is better than money itself since they can only use it in that store and you are assured that they will buy themselves a gift and not use it on anything else. You may want to throw in a little extra something to the gift package such as a personalized mug, a balloon, a teddy bear or anything else you think they will appreciate to give it an extra special touch. In addition, getting your present all wrapped up with quality gift wrap makes it all that more exciting, I mean wouldn’t you like to get a gift all wrapped up? Don’t forget to add a little note or card with your best wishes and make this gift memorable. Hope these ideas help you out with your holiday gift shopping.